The CDI Capital Growth Fund offers your growing Small/Medium Business (SME) access to grant funding, working capital and business support, thereby assisting your business to unlock its growth and create permanent jobs, as well as contributing towards the economic development and competitiveness of South Africa. In its first round (2012 – 2015), supported by the National Treasury’s Jobs Fund, we exceeded targets, creating 464 jobs in 45 businesses. Participating SMEs grew their combined annual revenue by 73% over three years. Now in its second round, with continued support from National Treasury’s Jobs Fund, our goal over the next three years is to support up to 60 businesses to create 600 new jobs. If you are an emerging SME who meets the fund criteria, and who is experiencing growth or are poised for expansion that includes creating permanent jobs, then you should consider applying to the Growth Fund. You can apply for an amount between R21 000 and R2million rand, depending on how many jobs you commit to creating in the three-year period. You can apply for R21 000 for every 1 permanent job created. You are also required to match the grant funding amount with 20% of your own cash. 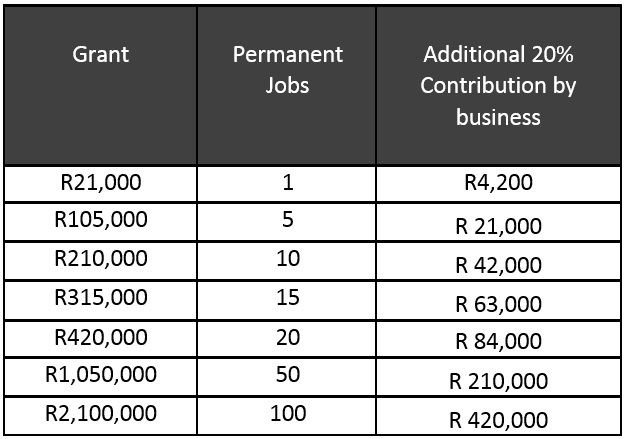 The table below gives you an idea, of how many jobs are required for a given amount of grant funding. What Are the Other Non-Funding Components Given to Successful Applicants? What Are the Criteria and Requirements for Applying? Be a South African-owned business, with the controlling interest of the enterprise (51% of the issued ordinary share capital) must be held by South African citizens with valid a South African ID or a South African Registered legal entity itself controlled by South African citizens with valid South African ID. Operate within South Africa, including but not limited to projects, programs or enterprises of the business. Be an existing business, at least 1 year old (preference will be given to businesses that have been trading for 2 years or more) with turnover or assets above R1m. Must create one job for every R21,000 grant investment. Once your application is successful, you will sign a contract and report on progress and impact to the Fund administrators on a quarterly basis during and for a two-year period after the project completion. APPLICATIONS ARE NOW CLOSED FOR THIS ROUND. What Do We Look For, When Considering Your Application? Strong Management team capability to drive the process. The application process will guide you in being able to present this information, and what is suitable evidence of the above. How Is the Grant Paid Over to The Business? The money is disbursed over a period of up to 3 years, in line with a mutually agreed intervention plan. We help you develop this intervention plan so that it fits with your growth strategy and is manageable. If we approve your funding, you can be assured that we have approved it on the basis that your intervention plan including your budgets and employment plan are feasible and viable for your business. What Can the Funding Not Be Used For? The purchasing of equipment or operational expenses that is not within the scope of work pertaining to the allowable activities and objective of your funding application. What Type of Businesses/ Business Owners Cannot Apply? CDI Capital is a niche emerging impact funder, and a for-profit Level 1 B-BBEE subsidiary of the Craft + Design Institute (CDI) NPC. 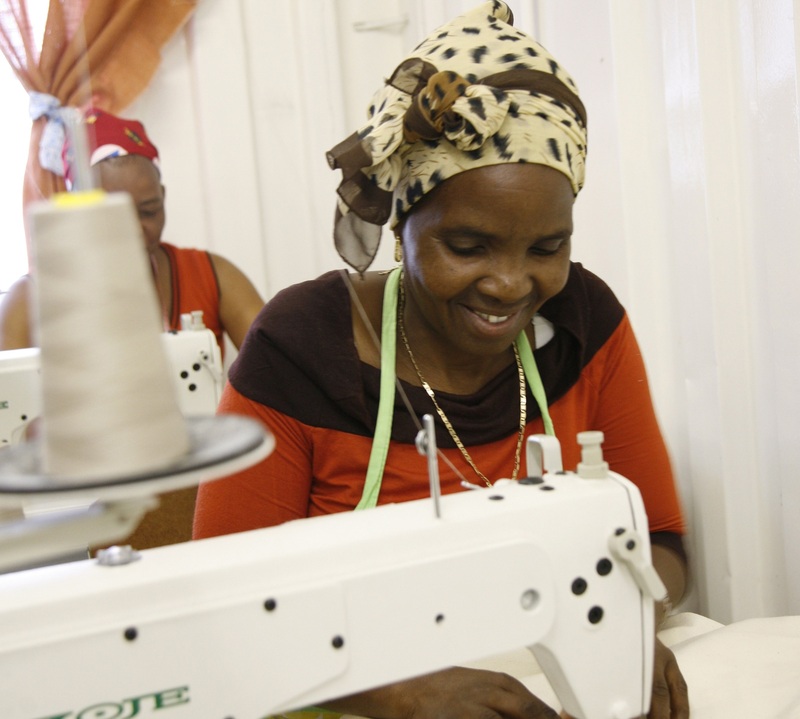 Respected as one of most successful and longest-standing SME development organisations in SA, CDI provides support to over 4300 SME’s who in turn create 11 100 jobs or income-generating opportunities. In the past three years, the CDI delivered 264 training workshops, mentored 574 businesses, ran 3 255 one-on-one sessions in product prototyping support and helped 3 774 businesses through 10 277 support activities to member enterprises, whilst generating over R8.9 million in direct trade. As an impact funder, CDI Capital is committed to creating positive social and economic impact in the SME sector and the South African economy. Our goal over the next three years is to support up to 60 businesses to create 600 new jobs. Applications can only be made online, on this website. Applications are now closed for the current round. The application is checked that it meets the minimum criteria to be eligible. If it does, then it is sent to a Steering and Investment committee for review. If successful, we then follow a process of setting up an intervention plan with you and meeting with you. Formal due diligence is done on applications over R1m. The full application process can be seen in the fund application flowchart diagram below. “The CDI has assisted us during the funding process with financial management and mentorship as well as export readiness.”— Ilundi (2012-15 funding recipient). The funding enabled the business to fully equip the workspace with the tools, machinery, office equipment and furniture to increase production capabilities; and they employed two more full-time staff members. Turnover increased by over 700%. “We had wonderful assistance from the CDI with the Jobs Fund grant to create jobs.” – RAIN (2012-15 funding recipient). RAIN’s staff complement increased from 50 to 172 during the project period. Turnover increased by over 120%. “We appreciate CDI’s mentoring and assistance. We are also thankful to the Jobs Fund. This investment has made a big difference in our business and it will go a long way.” – Imiso (2012-15 funding recipient). Imiso created four new jobs. Turnover increased by over 119%.